Well, Frosty had surgery day before yesterday and, as you can see, he isn't very happy. He tore the ligament in his left leg. He did it to his other leg almost two years ago. He's my bionic dog now. He'll be fine though because he bouces back pretty fast. In about a week, I will be walking him on a short leash and soon he'll be walking on it. It's a good thing that we love him so much because he has been very expensive. The haircut is kind of dorky. He looks like a poodle with a mohawk hair-do. He's embarrassed because he is a macho dog. I will be getting back to painting (hopefully) soon. At the moment, I am working on "Sails At Wailea Beach". After this one, I will paint a small orchid painting and then it is on to making greeting cards, giclees, and framing the originals for the Art-A-Fair show that starts the end of June...Can't wait! I am pretty much bummed out today. My dog Frosty, guess which one, tore a ligament in his left leg and needs surgery. 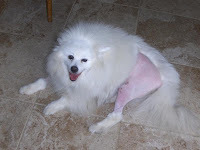 Two years ago, he tore the ligament in his right leg and needed surgery. The Vet actually builds a new ligament...he's my bionic dog. He will come home Thursday. He is a very expensive dog and it's a good thing that we love him. He needs to stop guarding our yard and making quick turns while running back and forth. Last time he didn't need physical therapy. I'm sure this time will be like last time. The only therapy that he had was when I took him for walks on a short leash. He enjoyed that. I'll post another picture when he gets home. As you can see, I started this blog ages ago and didn't come back. The reason? Well, this gal has been very busy learning new things. 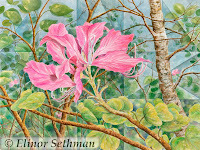 If you want to view my store, just click on www.zibbet.com/ElinorSethman My summer show in Laguna Beach is quickly approaching and I am sort of in panic mode, as usual. Will I get everything done? Yes but it will keep me busy. I have the same great booth as last year.... Booth C-8. My web site that my son manages is being updated. That site is www.blueribbonart.com I am also a member of www.Artists-Collective.com We have pooled together and placed an ad in the American Art Collector magazine, the May issue. I will try really hard to return here and let you know what's up in my life. Painting is a big part of my life. I paint in watercolor with Prismacolor pencil to add punch to the color. I have developed a technique that I call kaleidoscope. I show them at the Art-A-Fair Festival in Laguna Beach every summer. I paint all year for that show.